We’ve long been predicting Korean dishes as the next big cuisine, but they haven’t gained much traction outside of Korean neighborhoods – except in food trucks where they’ve been mashed together with Mexican tacos. Kogi, the seminal Los Angeles food truck that launched a thousand wheels, features Latino tacos filled with Korean ingredients, now being copycatted profusely. This will lend legitimacy to Korean flavors, and bulgogi, bibimbap and kimchee will enter America’s gastronomic lexicon. In Philadelphia, the world-food restaurant Meritage has been serving Korean short rib tacos at the bar, and Wednesday nights this summer featured Korean fried chicken for two, so word is getting around. Publicity surrounding the Momofuko chain also will give Korean a push. Watch for American chefs on reconnaissance patrols to LA and New York Koreatowns. And wait for a big breakout: A “big deal” Korean restaurant that is marketed to non-Koreans. Would that be the International Blue House of Pajeon? How accurate do you think they are about this? 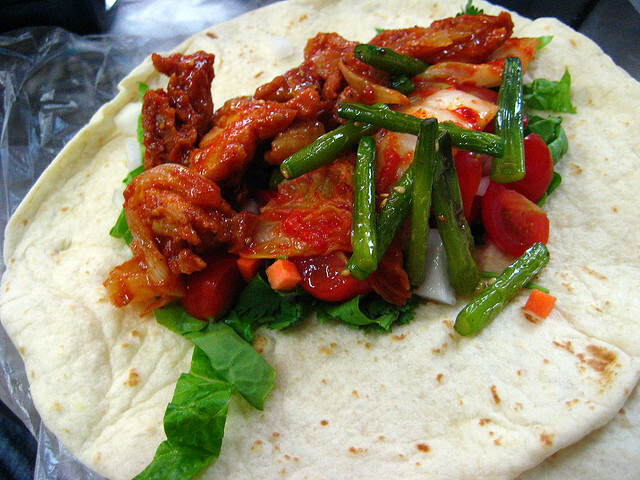 If Korean food is not making it out of Koreatowns without a tortilla wrapper, why is that? Next"Living and Breathing DNA, Hansik"
I never really had a taco with Korean ingredients I think that’s something to try. I really do hope that 2011 will be the year for Korean food to get to the mainstream.